Bayshore Waterfront Park, located in Port Monmouth next to Monmouth Cove Marina, preserves a thriving coastal landscape on Sandy Hook Bay. Enjoy the maritime shrublands, tidal creeks, salt marshes, dunes, mile of beach and scenic views across the water. The park offers a fishing pier, access to Raritan Bay, and beautiful views of the NY skyline. The Park System continues to add to this site's 229 acres in the Bayshore area. This park is also home of the Bayshore Waterfront Park Activity Center (Seabrook-Wilson House), one of the oldest surviving houses in the region. This large frame building, dating back to the early 1700's, was constructed in several phases over the course of two hundred years. The Park System acquired the building from Middletown Township in 1998. The building has been fully restored and now hosts Park System nature and history programs. Most programs require pre-registration. Upcoming programs at Bayshore Waterfront Park may be found be using our program search tool here. The building is open from 1-4 p.m. on Sunday afternoons, late April through October. To arrange a visit at other times, please call 732-787-3033, ext. 2. 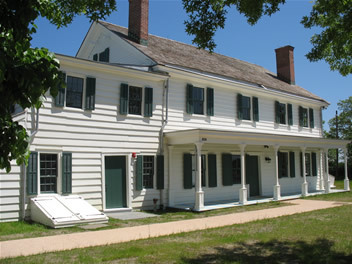 Inside, visitors can enjoy exhibits about the ecology of the Sandy Hook Bay, the history of the house within the greater Port Monmouth community, and the connection between them. Please be aware NJ anglers age 16 and up are now required to register with the NJ Saltwater Angler Registry (for free) to fish in marine and fresh tidal waters of NJ. For more information regarding the registration, click here. Sunday, May 19 from 1-2 p.m. Starting a shell collection this year? It’s the best way to get to know the Jersey Shore. Want to know where shells come from? Can’t figure out what you found on the beach? Bring it in and we will tell you all about seashells, how to collect them without harming the environment, and feature an assortment of live mollusks, crustaceans, and cool beach finds and artifacts. Join us for a series of eye-opening talks by Park System Naturalists to discover what’s lurking in the coastal waters of Monmouth County. The presentations are designed to inform the public of current issues, ecology and science research, and to inspire appreciation for the local natural world. FREE! Thursday, May 16 from 7-8 p.m. Horseshoe crabs are vital to the ecology of local tidal waters in Monmouth County. Every year, during the full and new moons of late May and early June, many horseshoe crabs crawl up onto beaches to spawn and create the next generation, as they have for at least 350 million years. But today there are many threats to the survival of these ancient seafarers. Join us as we discover why the population of horseshoe crabs is declining and what people are doing to protect the crab through research, and what you can do to help. It will be a fascinating learning experience. For more information about any of these offerings, please call Bayshore Waterfront Park at 732-787-3033, ext. 2#. The U.S. Army Corps of Engineers is undertaking a multi-phased flood control project in Port Monmouth. The project involves the construction of about 7,070 feet of levees, 3,585 feet of floodwalls, 2,640 feet of dune, and beach renourishment at 10-year intervals along the Raritan Bay and Sandy Hook Bay in Port Monmouth. The project provides protection to low-lying residential and commercial structures, built upon and near salt and freshwater marshes that are experiencing flooding caused by coastal storm inundation. This problem has progressively worsened in recent years due to loss of protective beaches and increased urbanization in the area with structures susceptible to flooding from rainfall and coastal storm surges, erosion and wave attack, combined with restrictions to channel flow in the tidal creeks. This area was devastated by Superstorm Sandy. The Preconstruction, Engineering and Design (PED) Phase was initiated in May 2002. A Hurricane Sandy Limited Reevaluation Report(HSLRR) approved December 2013. The first set of Plans and Specifications (P&S) have been completed and a Project Partnership Agreement (PPA) between the US Army Corps of Engineers and NJ Department of Environmental Protection was executed in January 2014. The dune, groin, pier extension and beach fill coastal features of the project have been completed. The remaining project components include Wetland mitigation, Pump Stations, Road Raising, Closure Gates, Levees, and Floodwalls. For more information please contact David Gentile, Project Manager U.S. Army Corps of Engineers, New York District, Phone: (917) 790-8483, david.gentile@usace.army.mil. See project map. Hwy. 36 in Middletown to Main St., Port Monmouth. Follow Main St. to Wilson Ave., turn left and continue to end. Turn left onto Port Monmouth Rd. Follow Port Monmouth Rd. to Park at end. Garden State Parkway to exit 117, follow Hwy. 36 south (see above).